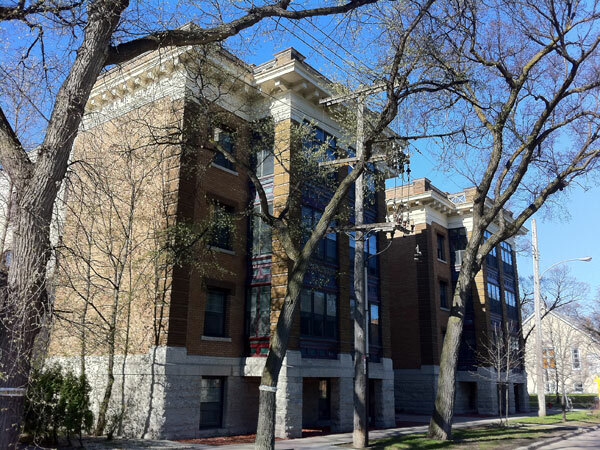 The Rothesay was designed by Winnipeg architect H. E. Matthews, and built in 1912 by local contractors (and building owners) Peter Smith and George H. Kirkpatrick. Kirkpatrick lived in the block until the mid-1940s. It was sold in 1946 to Benjamin Cohen, retired owner of the Manitoba Upholstering Company. It remained in his estate until the late 1970s. The building is a municipally-designated historic site. Rothesay Apartments (828 Preston Avenue), City of Winnipeg Historical Buildings Committee, February 1991.